Picking up 3rd place here’s Michelle’s race report. Racing up North is always exciting as the trails are completely unknown to most of us Southerners! It was my first time to ever visit Lumpers, which is crazy as it took just over an hour to get there from Wicklow. Bellurgan Park in Co Louth, is a private woodland in the heart of the Cooley mountains, just a stones throw away from the trails at Lumpers. 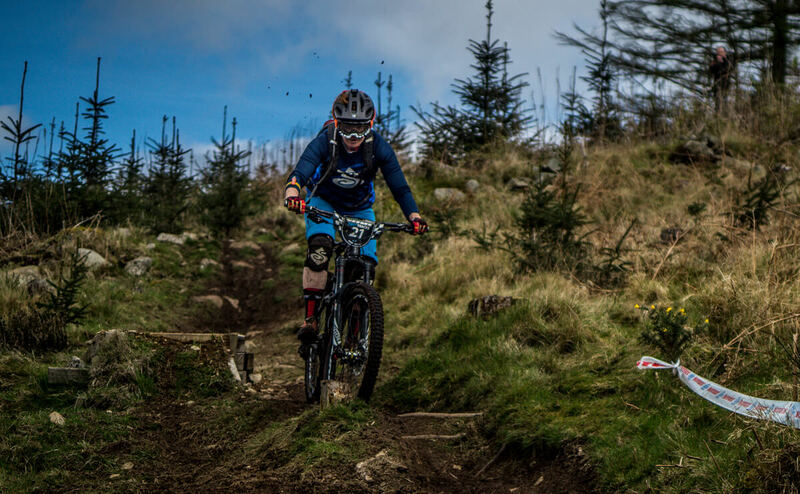 It was the perfect venue for Glyn O’Brien and his crew from First Tracks, to give us five timed stages, consisting of natural single track, as well as loose, muddy, technical trails, which were mostly gravity orientated. The lap including the transitions and stages was roughly 20km in total so it was very relaxed, just the way I like it! I had planned to camp at the race village in the van for the weekend, but when I realised how close it was, a lift up with Al Maxwell from the Bike Rack and gunner Gavin O’Connell, was a much more entertaining option, and just made a lot more sense. That and coming home for a good nights kip in my own bed! Arriving at 10am, we had the whole day ahead of us to practice the five stages and get our lines dialed. However, with the rain over the past few days, the once dry, loamy trails, were now transformed into slippy, bike-clogging trails that really tested me. It was the type of conditions that you only really ever get to ride at these events. A real test of riders skill and ballsiness! With 300 riders on the same muddy tracks, it really begins to expose the roots, rocks and holes and so commitment, line choice and staying loose was key to doing well this weekend. With practice done and dusted after about 4 hours on the bikes, it was time to get back to the van, give the bikes their first round of washing, have a quick bite to eat and get on the road to do it all again tomorrow! I was feeling ok, but not how I had hoped to feel by the end of day one. With a lack of practice riding in these conditions, I always feel its a real weakness of mine, as I am a much more conservative rider in this type of heavy wet mud. Just staying on the bike, maintaining flow through the rough parts and pedal like a beast on the pedally sections to make up for lost time was my main aim. We were so lucky with the weather, the sun decided to come out for the day and by the time we got to the final stage, the clompy sections had dried up quite a bit and gave us a lot more grip on the trails. I was feeling fresh and ready to go, but just as I was about to head over to the tent to clock in, my shoe lace broke!! I couldn’t believe it! I blamed my mate Gav who was sitting in the van with the same random problem with his shoe! Seriously what were the chances of this happening! However, the ever reliable and simple cable-tie (a must for every mountain bikers backpack) came to the rescue and panic subsided. With the mud caked onto the bikes, I was very glad I brought my portable bike wash with me! And it wasn’t just the bike that needed a hose down! Stage 1, was awful for me. I had a messy start and things didn’t improve. It seemed like everyone else had a similar experience so I didn’t feel so bad! Stage 2 was a lot better and I rode much more to my capabilities and finished it smiling – always a good sign. Stages 3,4 and 5 were all better than stage 1 but I made way too many mistakes to catch up. I did my best to pedal hard on the pedally sections like I had planned, and at times I rode really well but it just wasn’t enough for me and in the end I finished 3rd. Reflecting on the race, and with my tendencies to be very self-critical, I felt that ultimately my fitness is not where it needs to be and this really was a kick up the rear to get my diet in check. No matter how hard you train, if your diet isn’t clean 80% of the time, then you are not reaping the benefits of your hard graft. For me, I have a great diet the majority of the time, but with my very sweet tooth, I’ve yet to break the sugar addiction! With Enduro racing, fitness is KEY. And the key to fitness, I believe, is diet. So, I have just 7 weeks to go until the biggest and most important race of the season – Round 4 of the Enduro World Series in Ireland. My goal is to be at the top of my game for this so, its game on! Massive well done to Vitus First Tracks for putting on a brilliant first round of the series. The turnout was excellent, with a stacked field of top riders. Really looking forward to Round #2 in Donard in just a few weeks, what better way to prepare for the biggy!! A massive thank you to WTB for sponsoring me this season. This weekend I ran a Convict on the front and Vigilante on the rear, a super combination for these conditions. Next stop……Killaloe, Co.Clare for Round #2 of the Grassroots Enduro. Race season is well and truly ON.